The Italian-style home has an ocean view, fountains, six fireplaces, five bedrooms and nine bathrooms. With nine bathrooms, there’s never any waiting time! 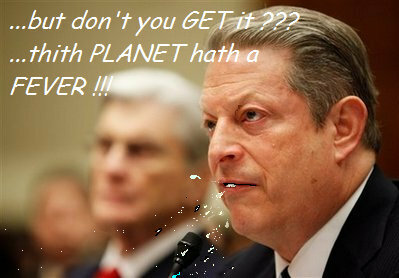 I wonder if Al’s keeping the million-dollar 100-foot BS1 houseboat on Center Hill Lake,Tenn., and if he does, how about the carbon footprint of flying back and forth between the two locations? Delighted at his cyber success, Venezuela’s new Twitter convert President Hugo Chavez on Thursday invited Cuba’s Fidel Castro and Bolivian President Evo Morales to join the micro-blogging site too. After several months grumbling that social networking sites in Venezuela were dominated by opponents of his socialist government, Chavez opened his own account this week and was clearly elated to have gathered 106,000 followers in two days. “The potential this has … it’s not capitalist, it’s not socialist, it depends on how it is used,” he said after posting two messages on his page @chavezcandanga. “I invite Evo and Fidel,” Chavez said. “Evo – are you on Twitter? 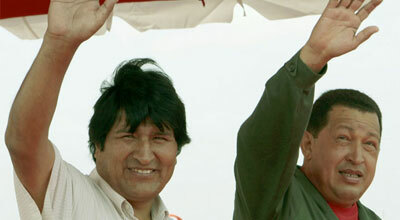 Let’s invite Evo to Twitter,” Chavez said during a visit to a cattle ranch with Bolivia’s president. Separately, a 29-year-old Venezuelan was arrested on Thursday in connection with text messages calling for the assassination of Chavez, authorities said. Interior Minister Tareck El Aissami said the man was detained in Merida, a city near the border with Colombia, along with computers and other materials. “Death to Hugo Chavez, for a fatherland free of tyrants,” read the text, according to the minister. Neither does the rest of Venezuela, where a punishing, months-old energy crisis and years of state interventions in the economy are taking a brutal toll on private business. The result is that the economy is flickering and going dark, too, challenging Venezuela’s mercurial leader, Hugo Chávez, and his socialist experiment like never before. No matter that Venezuela is one of the world’s great oil powers — among the top five providers of crude to the United States. Economists say Venezuela is gripped by an economic crisis that has no easy or fast solution, even if sluggish oil production were ramped up and profligate state spending were cut. Talking about Latin America right now. Hillary believes that granting Ahmadinejad a visa “means little,” and she used strong language. I’m sure they mullahs are quaking in their boots. We’re not, we’re not trying to push financial reform because we begrudge success that’s fairly earned. I mean, I do think at a certain point you’ve made enough money. Obama made $5 million last year. Why doesn’t he cede all that income to the federal government? Or hasn’t he reached the point where he believes he’s made “enough money”? When did it become the “core responsibility” of ANY business to “help grow our economy”? In the America I grew up in, the economy grows when individual businesses – who are in business to make a profit for themselves and their shareholders, not to “grow the economy” – grow and prosper. Businesses have no duty to “help grow the economy”. They don’t work for the President of the United States, nor for their fellow citizens. They work to provide for themselves and their families. This president displays a stunning cluelessness regarding the incentives that motivate ordinary people. Explains a lot about health care reform, doesn’t it? It explains a lot about all his economic policies. Maybe the country ought to learn never to elect to office anyone who’s never held a job in private industry. I took the trains (New Jersey Transit and Path) every workday from Convent Station to Manhattan. The hundreds of people in those trains were pursuing their goals, not simply “going through the motions”. Now we’re paying (and our children and us will be paying through the nose) for having elected a narcissistic elitist socialist to the highest office in the land. It’s just that President Obama’s understanding of how the world outside of politics works – he understands how the world of politics works very well – is the opposite of the truth. What he thinks will work, will fail. And what he thinks will fail, will work. The US, asleep at the wheel. Car rental company Sixt makes fun of Nicolas Sarkozy in a poster advertising campaign. Will the French president see the funny side? There could be trouble ahead for the car rental company Sixt following its latest advertising campaign. 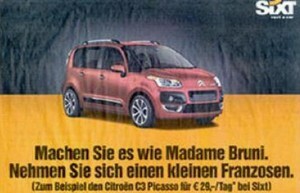 A German poster for the company carries a picture of the French hatchback the Citroën C3 with the slogan encouraging customers to “Do the same as Madame Bruni, choose a small French model” ((“Machen Sie es wie Madame Bruni. Nehmen Sie sich einen kleinen Franzosen”).